The scapular is worn as a sign of devotion to Mary and in Catholicism is associated with the Carmelite religious order. One piece of rectangular flannel is worn on the chest and the other on the back connected by a length of fabric. Many Catholics believe that the Virgin Mary can protect them from illness and other dangers and give help in times of need. The inscription translates from French as “Remember us your children, sacred heart of Jesus and Mary, protect us”. The image shows Mary, Mother of Jesus as the Blessed Virgin of Mount Carmel. 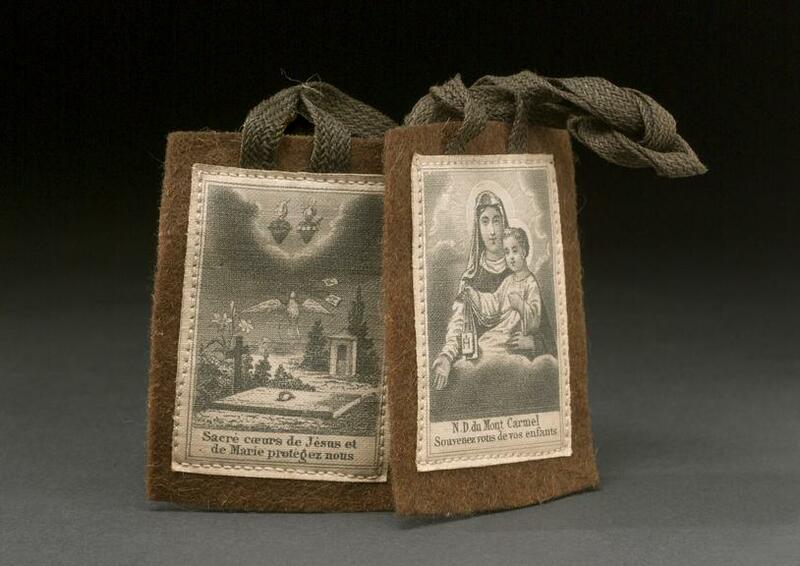 In Catholic history, the original brown scapular was said to be given to Saint Simon Stock in 1251 by the Virgin Mary herself. The scapular was taken up and worn by the Carmelite order who declared 16 July – the date of the Virgin Mary’s appearance – as the feast day of the Blessed Virgin of Mount Carmel. This small scapular is symbolic of the larger ones worn by the Carmelite order and may well have been bought by a believer as a sign of devotion and for protection.